The design needs to outwardly reflect how the structure goes together if it were built using the materials available back in olden times. Using old materials it was not possible to span big widths, so it will look wrong if you have openings in the walls that are too wide. You could with today's materials build strong columns that are very thin, but they would look wrong. The bottom line is that it must be obvious to the eye how the structure is supported and put together. It must be obvious how the building stays up and it should look solidly built. 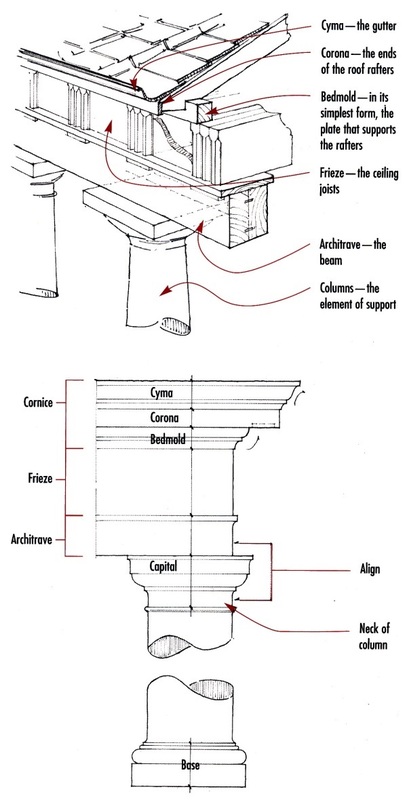 Architrave - Columns support a beam across the columns. The tops of the columns are wider than the beam supported. The Architrave supports the Frieze. Frieze - The ceiling beams rest on the beam so what you see are the end of the beams. The Frieze supports the Cornice. Cornice (made up of the Bedmold, Corona, & Cyma) - The roof edge details. The study of the ancient elements of construction and how the fit together is called Tectonics. In classical architecture, things are symmetrical (right/left) unless there is a very good reason for it not being. Where possible, the tops of windows should align horizontally. Often the tops of doors are also aligned with the tops of the windows, although occasionally you can deviate from that. 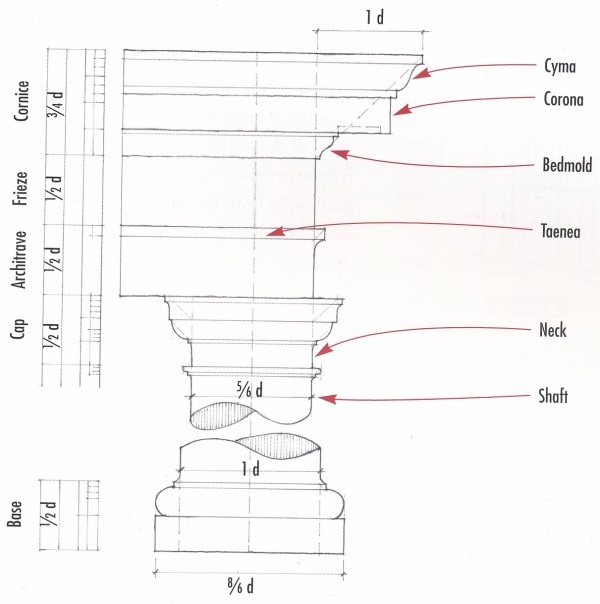 Orders aim to categorize the different ancient architecture styles, eg column style, but many other aspects too. You will hear names such as Doric, Tuscan, Ionic, and Corinthian. Personally I like the Tuscan style (as pictured below) because it is the cleanest look and the simplest to implement. 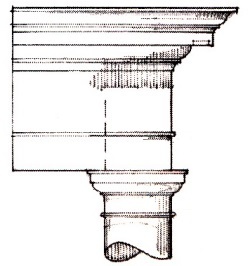 The Entablature (which is the Architrave+Frieze+Cornice) should have a height that is 1.75 times the column base diameter. It is very important to get the column alignment correct. The edge of the top of the shaft aligns with the edge of the beam (Architrave) and the edge of the ceiling joists (Frieze). Columns do not support the ceiling directly. Instead they support a beam (Architrave) that is what actually supports the ceiling joists (Frieze). The beam is likely to be somewhere between 8" and 12" tall. When there are two stories of columns, the alignment must be as per the following drawing. Railings above should also be aligned. It is good to try to make the railings seem lower than the 36" that building code requires. This can be done by including an additional horizontal rail that is 4" below the top rail. Also the bottom rail can be 4" above the concrete. The front face of the Architrave should align with the edge of the top of the column. The front edge of decks are supported by columns, but visually the deck also needs to be supported as it attaches to the building. 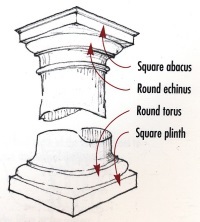 Either this needs to be an "engaged column" (round) or it needs to be a "Pilaster" (rectangular). Columns are the width of the tapered columns and project out between 5/8 and 3/4 of the column width. Pilasters are the width of the top of the column and project out from the wall between 1/5 and 1/4 of the column width. My preference is pilasters. 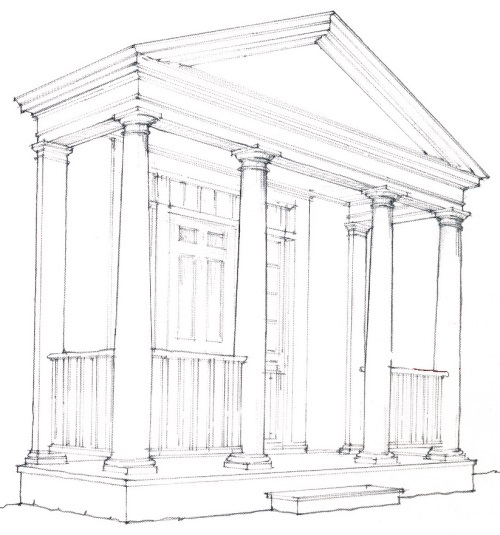 A "Tetrastyle Portico" has four columns. It was often used by the Greeks and the Etruscans for small structures such as public buildings and amphiprostyles. 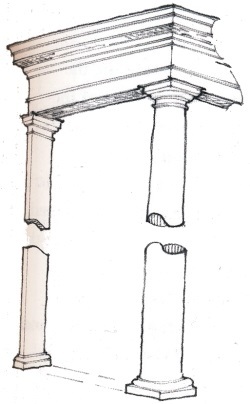 The Romans often used the four columned portico for their pseudoperipteral temples like the Temple of Portunus, and for amphiprostyle temples such as the Temple of Venus and Roma, and for the prostyle entrance porticos of large public buildings like the Basilica of Maxentius and Constantine. Roman provincial capitals also manifested tetrastyle construction, such as the Capitoline Temple in Volubilis. The North Portico of the White House is perhaps the most notable four-columned portico (ie "Tetrastyle Portico") in the United States. 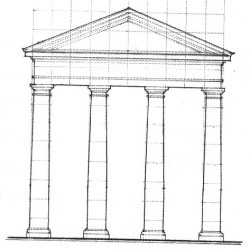 In a typical Roman temple, the area of the portico top (ie the Entablature and Pediment) is the same as the area of the columns. The pitch of the Pediment should be between 21.5 degrees and 31.6 degrees. In the case of Roman architecture, the usual choice is 22.5 degrees. Personally I chose to use 30 degrees. The slope should be less than the roof (hip) slope. If the front door has a sloped cap then its slope should be even less. You must use a "Raking Cyma". 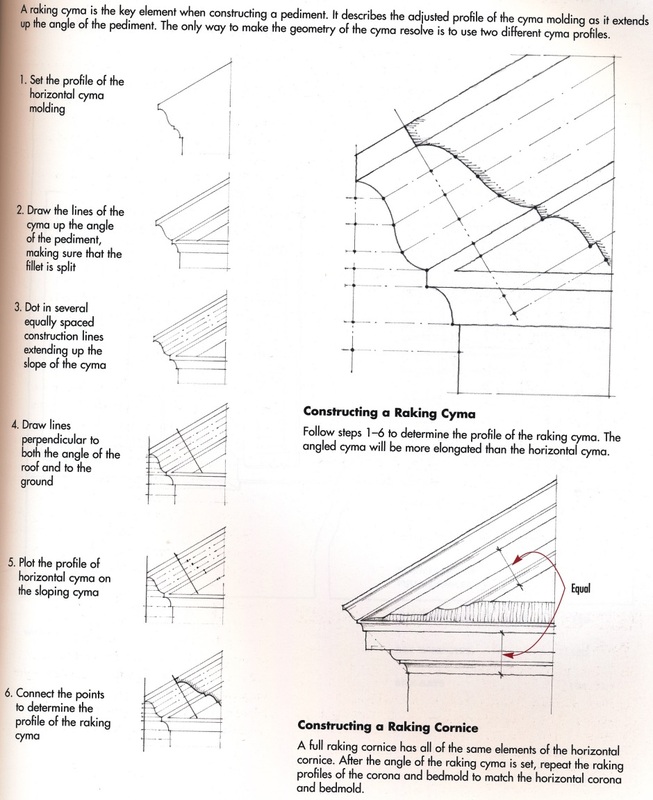 This basically means that the Cornice (Bedmold+Corona+Cyma) used on the horizontal is also used on the sloping roof. The sloping part protrudes forward due to it having the actual roof on top of the Cyma.